This jig holds the Perspex/acrylic while it resets. The angle of the bend will depend upon the distance between the base strips. A batch of these shapes may be placed in between the strips at the same time. This will increase the speed of production. The surface of a jig must be well finished. To prevent the grain of a wooden jig from appearing on the shaped plastic it may be a good idea to cover the wooden jig surface with card or other smooth materials. When making simple bends or curves in thin plastic you may wish to make the jig shown in this unit. The heated, soft plastic slides into the jig and is held there until it resets. This type of jig can be made from scrap wood or MDF. 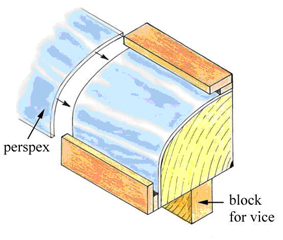 The curve in the wooden block may be sanded on a belt sander and covered with card or another smooth material. 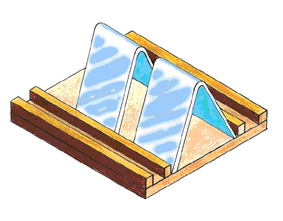 The jig can be held in a vice when inserting the plastic. Protective gloves should be worn when handling hot plastic. The disadvantage of this jig is that although it accommodates a variety of material widths it does not accommodate a variety of material lengths.